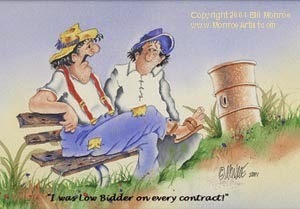 Organic Garden Works: Organic Gardening "News You Can Use" & "The Sunday Funnies"
Organic Gardening "News You Can Use" & "The Sunday Funnies"
"I was low bidder on every contract!" Tidbits of news you may not get on the local broadcast. Software For Water-Wise Landscaping: New update release to computer software that take the guess work out of xeriscape planting by helping you pick plants for water-wise gardens and landscaping. We need all the help we can get. To save money. The economic meltdown has created more interest as folks are looking for ways to make their budgets go farther. There may be an up-side to the down-turn. For better taste. Most everyone knows there's no comparison to a home-grown tomato and those anemic ones at the grocery store. To reduce exposure to chemicals. There's more awareness about the accumulative effect of long term exposure to even low levels of chemicals - not to mention the food contaminate-scares of late. The Hazards of That Perfectly Green Lawn: American's obsession with the perfect lawn may be killing them. Over applications of fertilizer, pesticides, herbicides, you-name-it-cides, have consequences of run-off, over-exposure of pets and children, and toxicity to wild-life. Company spokesmen say people need to follow instructions on lawn care products carefully so as not to introduce excess poison and toxic chemicals into their environment. I don't know...when a product needs to be so carefully measured in order not to make us sick, and all just for a greener lawn, it gives one pause. "Is there something out there that will make my lawn green without killing my dog?" 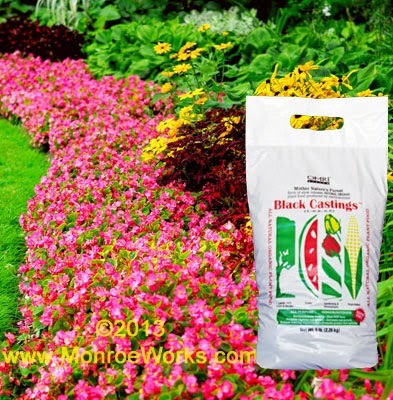 Pure Black Castings® and VermaPlex®: Organic fertilizers from earthworms. Non-toxic. Safe for pets, children. Use it on your lawn, in your garden, around your plants, in your coffee, heck - pour it on your head......not to worry. Digger returns with his take on our efforts to keep this little farm "green".